The members of the Electro-Matic Integrated Track Team are experienced in the design, assembly and installation of populated cat-track modules with a focus on the optimization of electrical and mechanical aspects of these assemblies. Industrial Connectors, bulk Industrial Cable and Industrial Cable Assemblies for use in production tooling, servo motion control systems, industrial automation systems and more. 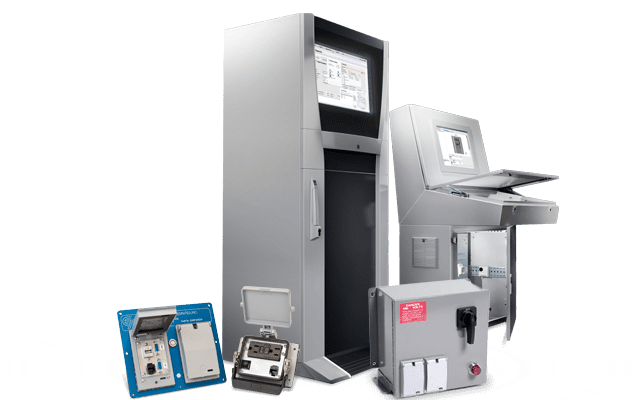 Modified and Assembled Industrial Enclosures, Remote Programming Ports, Power Disconnects. Electro-Matic Integrated offers a versatile and wide-range of product offerings provided by our partners to seamlessly integrate into your project's application. Electro-Matic Integrated works hand-in-hand with Ford Motor Company to design a transformer disconnect that supplies AC power and 24VDC. The AC transformer can be 1K, 2K or 3KVA, and the 24VDC can be 10 or 20 Amp.